We are in beautiful Hales Corners, WI just seconds from where I-43 and I-894 intersect. The perfect location for families from the area to meet up for games, or traveling teams from as far away as Illinois to play in our hosted tournaments. 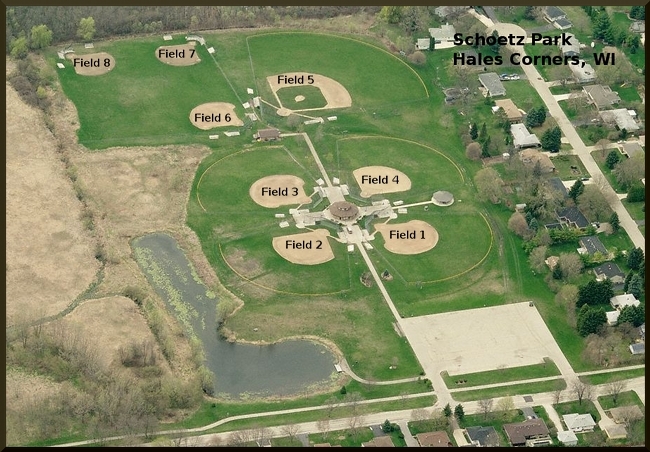 The park consists of 8 beautifully maintained fields, which during the week are dedicated to our recreation program, and on the weekends hosts tournament and league play. Our full concessions pavillion is always well stocked and staffed throughout the season by our parent volunteers. We offer a range of cold soft drinks, snacks, and the classic ballpark hot dog. Check out our menu here. Your help in keeping the park safe and clean is greatly appreciated.